Several years after the events of Alice’s Adventures in Wonderland and Through the Looking Glass, Alice finds herself back in Wonderland and called upon to save the world of playing cards and talking animals from the increasingly deranged Queen of Hearts. But all is not as it first appears in the fluctuating dream world and soon Alice is battling to save herself from the nightmare that is rapidly overtaking the realm. Have you ever wondered what would have happened if Alice hadn’t drunk from the bottle labelled ‘Drink Me’, or if she hadn’t joined the Hatter, the March Hare, and the Dormouse for tea? Well now you can find out - and take part. 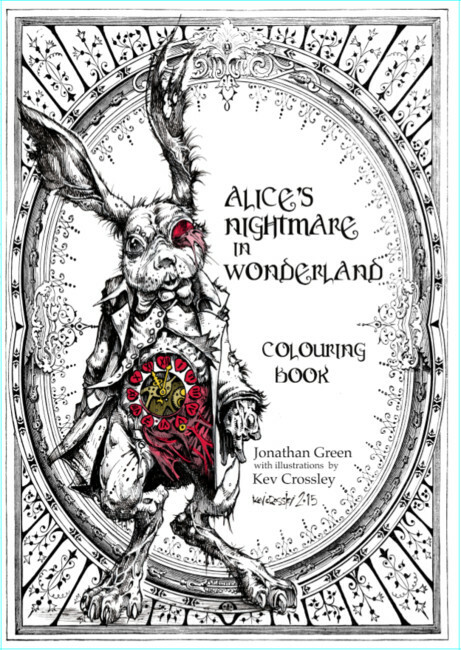 In the Alice’s Nightmare in Wonderland Colourist's Book - a companion to Jonathan Green's new Choose Your Path Adventure Book - YOU decide how the amazing creatures Alice encounters should appear. Because this is your chance to team up with illustrator Kev Crossley (of 2000AD, KISS 4K and Warhammer 40K fame) and create something... wonderful. Are you ready to join Jonathan Green and Kev Crossley and go back down the rabbit-hole?